Some of my greatest food loves are ones that my boyfriend does not share (artichokes, very dark chocolate, and tea or coffee flavoured desserts), especially in the ice cream department. So, when he goes for Stracciatella (which I don’t deny is delicious), I go for coffee or tea flavours. I am sure I have mentioned it before, but the ice cream at Bella Gelateria in Vancouver is by far the best I’ve tasted. They have so many great flavours, it was always hard to choose, I never had the luxury of trying them all. I have, however, tried the Earl Grey gelato and it is out of this world. So, really, there is only one thing to do: time to turn to my trusty ice cream maker. I’ve played around with a bunch of different ice cream flavours in the past. I’ve learned that I don’t like my ice cream too sweet and I am a fan of one clear flavour shining through. 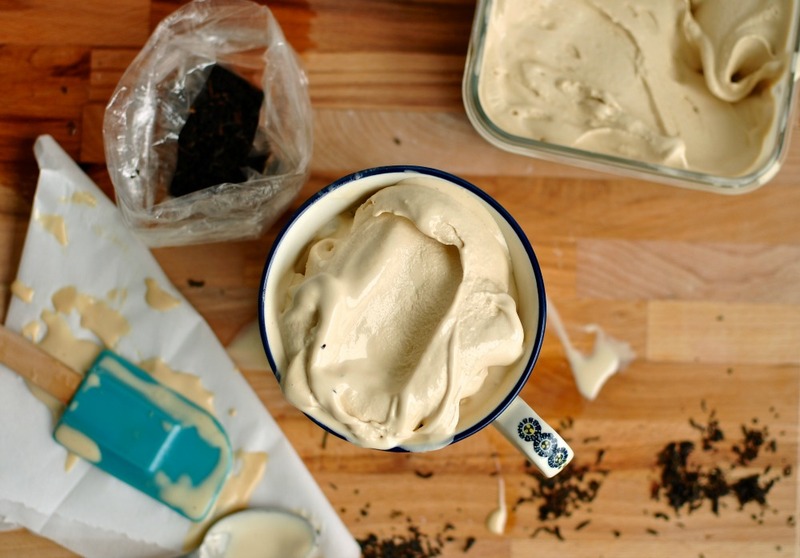 This earl grey tea ice cream has a clear, strong earl grey tea flavour. It’s really important to use good quality tea in this recipe. I can’t wait to start playing around with other tea flavours, including matcha (which I have to get my hands on! Get your act together, self). 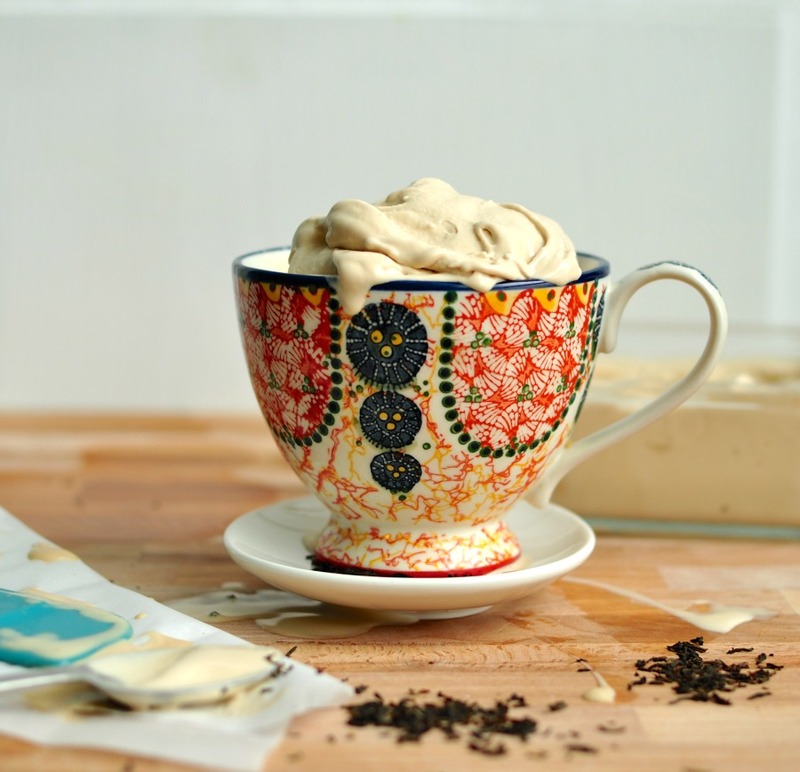 If you are a fan of having a warm cup of tea with a splash of milk and something to sweeten it up, this ice cream is a no brainer. The ice cream is creamy, not too rich, just sweet enough and has all of the tea flavour you could ask for. I loved it plain but a real treat was to take a scoop of the ice cream and pour some earl grey tea over top, affogato style. It’s seriously unreal. The cold and the hot give the best sensation. For many of us who are in the heart of winter (but are still ice cream lovers) it’s probably the best way you can eat this sweet treat. 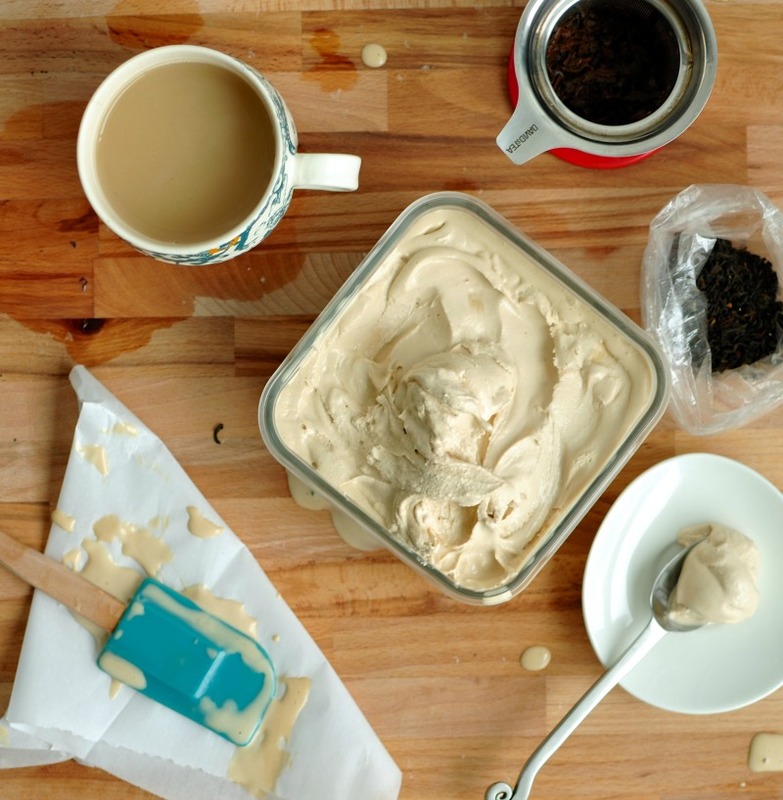 My strategy for this ice cream was to double the amount of tea that I would normally use (for the amount of liquid) to make sure that the flavor came through strong and clear. 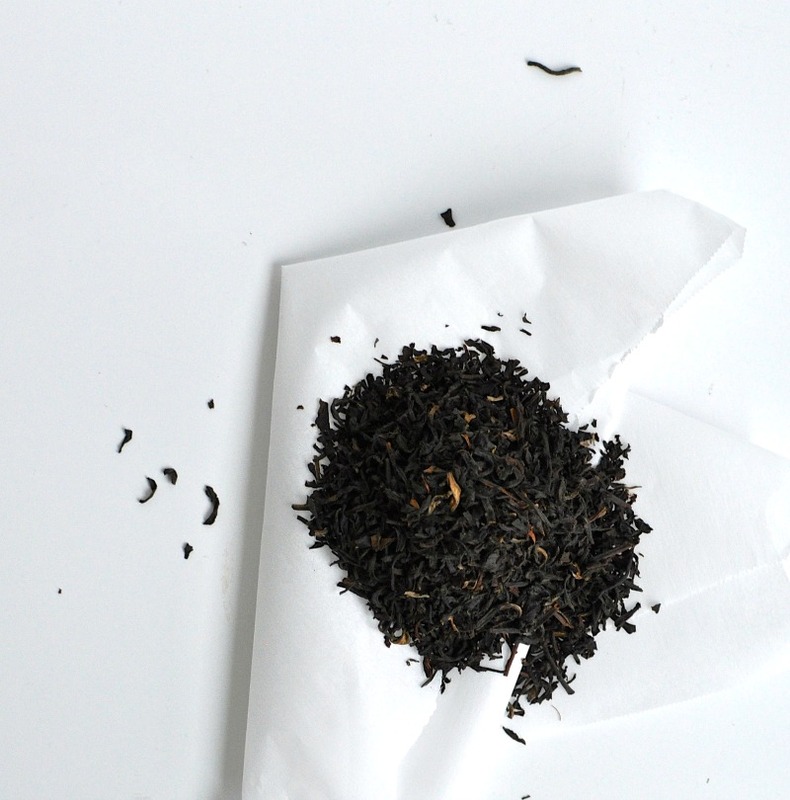 It doesn't need to be steeped any longer than you usually would, to ensure that the tea doesn't release any bitter flavor. 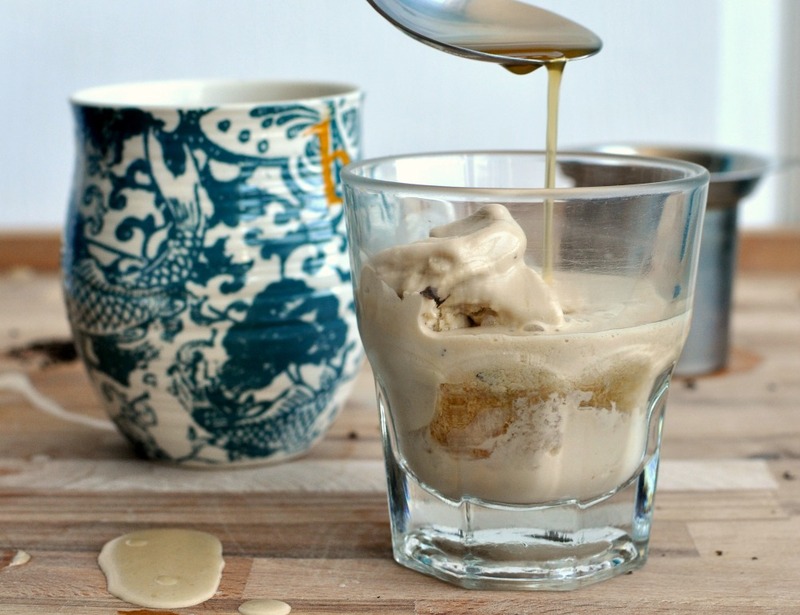 This ice cream is especially delicious affogato style: pour some freshly brewed earl grey tea over a scoop of ice cream. It's amazing. In a small pot, heat up milk to a simmer. Add tea, remove from heat and let steep for the normal amount of time (about 5 minutes). In a small pot, heat up tea-infused milk, sugar, and salt, stirring until sugar dissolves. In a medium bowl, whisk egg yolks until they start to turn light in colour. Slowly add the warmed milk mixture to the eggs, whisking all the time (you need to add a bit of the milk at a time so that the eggs don't curdle). Once the milk is fully incorporated into the eggs, return the mixture to the pot and heat over medium heat, stirring with a wooden spoon, until thickened. The mixture should coat the back of a spoon and hold a line. 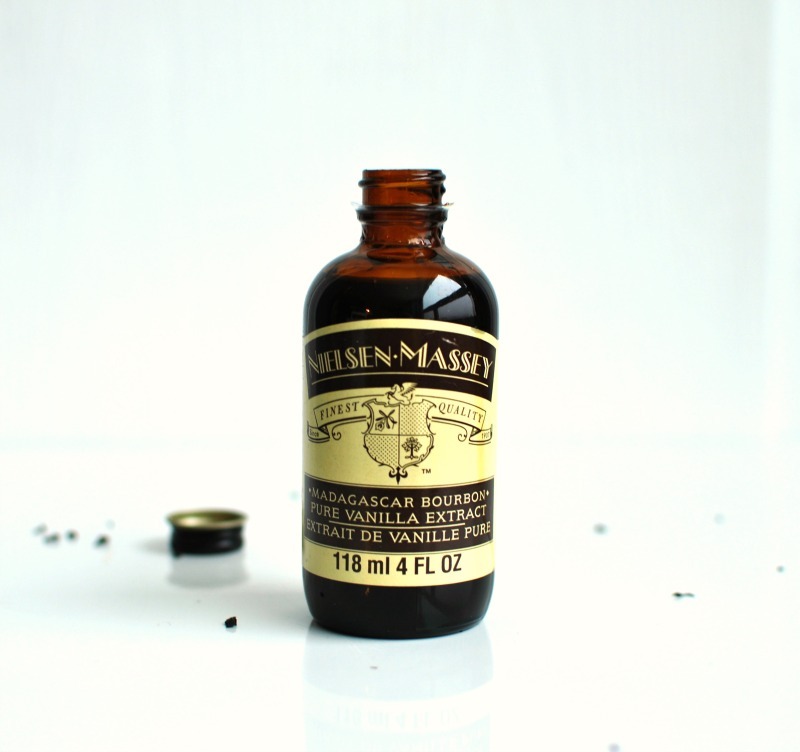 Pour mixture into cold cream and add vanilla. Mix until combined. Put in fridge to cool down for at least 4 hours. If you want to speed up the cooling process, you can place the bowl with the ice cream mixture into an ice bath and stir (it will still take a few hours to fully cool down though). Make ice cream in ice cream machine, according to manufacturer's instructions. Transfer to a freezer-safe container and freeze for a couple of hours for it to completely firm up. 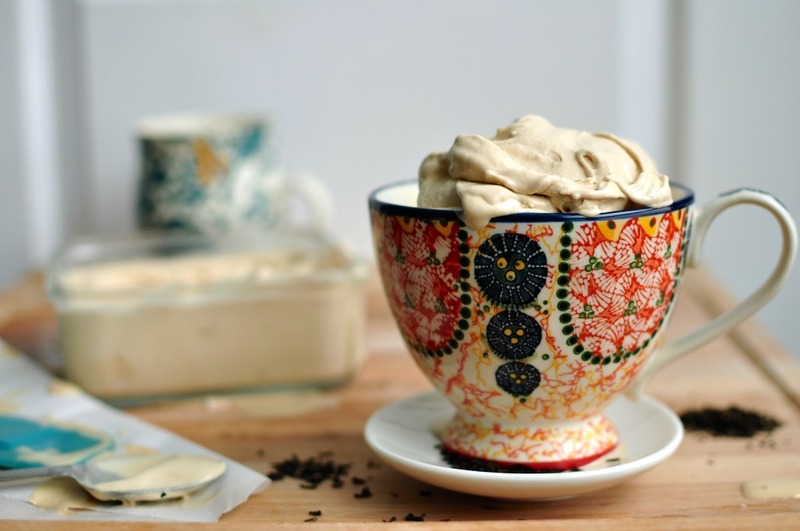 Put a scoop of earl grey tea ice cream in a small bowl and pour some freshly brewed earl grey tea over it. I made this ice cream over the weekend and I LOVE IT! Thanks for the great recipe. I used whole milk instead of 1% and I went with Bigelow Earl Grey (it’s not fancy, but I’ve always found Bigelow to have a nice, strong flavor). It turned out delish. I am so glad that you decided that there was a need for one more food blog as your blog certainly fills a void for me. My goal: to make EVERYTHING on your blog at least once. I have started with your Earl Grey tea ice cream. I served it after dinner this evening to accompany the Earl Grey-infused chocolate ganache and fresh fig tart that my friend made for our Canadian Thanksgiving. Everyone was really impressed with this recipe. I personally loved the light caramel color of the final result. It was a huge hit. Next up, hot-spiced turmeric milk with breakfast tomorrow morning. Laura, I’m so glad that you enjoyed the ice cream and that you got to share it with your loved ones for Thanksgiving. Also, thanks so much for the kind words. Knowing there are people like you reading and making the recipes I share makes having this blog so worthwhile! Oh my goodness, I know I just left a comment, but hello from Vancouver! If you love earl grey ice cream, you should definitely give Rain or Shine’s (in Kitsilano) ice cream a try! I wish I still lived in Vancouver. I’m actually in Calgary now. Next time I visit, I’ll have to check it out!